ARC8 is programming software for the Uniden BCT8. ARC8 includes the most versatile memory editor available on the market. 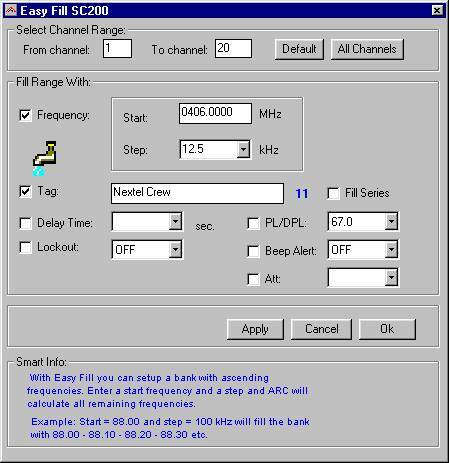 With ARC8 you can easily IMPORT frequencies from ANY website into your BCT8. Setup your Uniden BCT8 in an easy spreadsheet type interface. Setup your own memory bank 'tags'(software use only!). With EasyFill you can use memory banks as search banks because the BCT8 does not have user search banks. Import frequencies directly from any website with the famous Webcatcher (integrated in ARC8 !). With WebCatcher frequencies you found at any website are uploaded into your 250/785 within 1 minute without typing over these frequencies. Please compare our software with other packages. Unlike other companies we constantly improve our products and we do answer email!